Vitimite: Mineral information, data and localities. For the Vitimskoe plateau, Buryatia, Transbaikal region, Russia, on which the type locality is situated. This page provides mineralogical data about Vitimite. 6.H0.10 Braitschite-(Ce) (Ca,Na2)7(Ce,La)2B22O43 · 7H2O Hex. 6.H0.20 Iquiqueite K3Na4Mg(CrO4)B24O39(OH) · 12H2O Hex. 6.H0.25 Wardsmithite Ca5Mg[B4O7]6 · 30H2O Hex. 6.H0.35 Halurgite Mg2[B4O7]2 · 5H2O Mon. 6.H0.40 Ekaterinite Ca2(B4O7)(Cl,OH)2 · 2H2O Hex. 6.H0.50 Canavesite Mg2(HBO3)(CO3) · 5H2O Mon. 6.H0.55 Qilianshanite NaHCO3 · H3BO3 · 2H2O Mon. Chukanov N.V. et al. 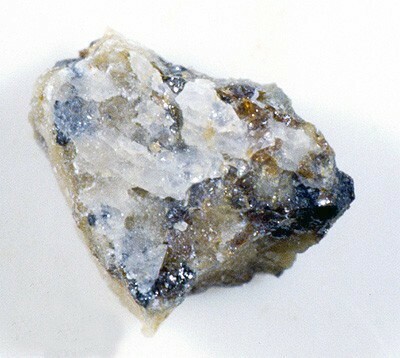 (2002), Zapiski Vserossiyskogo Mineralogicheskogo Obshchestva: 131(4): 41-46.